There comes a time in every civilization where the forces of good and progressive thinking have to face the forces of ignorance, evil and tyranny. What becomes of the later generations depends on what is done there and then in that place at that time. Find out if you may have taken part when these two forces went head to head. The is a science fiction story that takes place during the Middle Ages era. Indifference is no longer an option. The full moon was sharing the sky with thousands of stars. Walking toward a gigantic old oak tree near the top of a small hill was a lonely alchemist wizard. He made his way to the tree with the help of carved light cane emitting a pale soft blue color. He was dressed in a dark blue and white robe. Under his tall hat, his long brown hair and his beard were blowing at every caress of the light wind. Both hair and beard were nearly touching the ground. They were so long. One could easily tell that he had probably never cut them throughout his whole life. He pulled a large thick big book from his shoulder pouch. 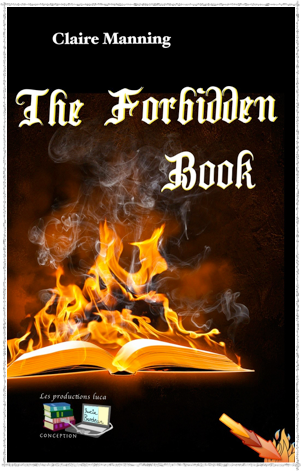 The book was covered in black leather elegantly engraved with flames and a partially blooming red rose beneath them. He placed his cane on the ground and slowly went down on his knees to deposit the book at the foot of the oak tree trunk. It was the last time he heard the familiar wood burning like crackling sounds from the book. – Your legacy has to be passed on to someone else. Somebody will have to find you and discover what is bound within your cover. I have to leave you to your own faith... Goodbye my dear friend. Picking his cane up from the ground and lifting his long robe, so he could regain his footing, he took a last glance at the book and walked away. The wizard never returned to the location. He was never seen around the oak tree or anywhere else ever after. This was his second and last visit to this site and to the world of man. His name was Thomas. He had a very enigmatic persona. He might have been one of the last remaining alchemist wizards who had existed during the Middle Ages era or even before that time as one of the possible medieval ancestors of chemistry. But no one knew for sure. He had been the protector of the book for a very long time. The book contained information said to be centuries old. From an unsubstantiated legend, it had been given by a being not of Earth. His name was Beelzebub. The content of the book was not of human origin. Once upon a time, there was a book that had a very compelling power. Only the chosen ones could open it to view and read its contents. Every time the pure of hearts opened it, everything surrounding it was transformed into a very futuristic world. To their great amazement, appeared a mystifying world in their presence. While the landscape looked as natural as the one of Earth, with trees, rivers, oceans, mountains with ice caps, etc., everything else was built of pure blue crystal. All the buildings and sky scrapers shone under the sun. The place was meant to be peaceful and all the people living in this world were friendly. They had apparently lived in this world for many millennia and were the direct metaphorical offspring’s of Beelzebub. They were very advanced in technology and sciences. Beelzebub was not the devil some civilizations portrayed him as being, quite the contrary in fact. He had helped create a civilization that possessed all the technology and scientific knowledge. They knew everything the spectrum of all the past, present and future universes and multiverse could give. They were way beyond the time of research and discovery. Their mind was set on a path that no one else in the universe had attained. They were the only ones to know it all. Always and never didn’t exist for them. They were in a completely different concept of time. These supreme beings had come into existence within the blueprint of Beelzebub’s image. They were the immortalized angels who knew everything that was to be known. There were no secrets or undiscovered subjects left to be unravelled. They were strong physically and spiritually and furthermore very bright and logical people. This entity named Beelzebub originated from the depths of space from the brightest star to have existed and still remaining the brightest of all to this day. It was the star named Sirius where he had built this civilization.